The classic much-loved children's picture book We're Going on a Bear Hunt is now translated into te reo Maori. 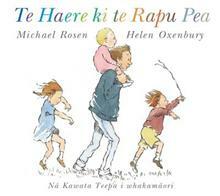 With the same beautiful illustrations as the original book, the English text has been translated into fun, rhythmical, onomatopoeic te reo Maori as children swish through long grass, splash through water, squelch, stumble and tiptoe on their bear hunt. The author Michael Rosen is well-known as an author of children's books, a poet performer, broadcaster and scriptwriter. He has been involved in the production of more than one hundred books. He lectures at universities on children's literature, reading and writing, and he gives presentations to school children to encourage enthusiasm for books and poetry. The illustrator Helen Oxenbury is a multi-award winning children's book illustrator, including having twice won and four times having been the runner-up for the Kate Greenaway Medal, the British librarians' award for illustration.